Call me a devoted pacifist, call me a wimp – really, either way. Guns actually make me uncomfortable, at least in real life. Of course, we have an entirely separate industry of violent fantasy. And to a sound designer for games or soundtracks, Weaponiser’s benefits should be obvious and dazzling. But I wanted to take a different angle, and imagine this plug-in as a sort of swords into plowshares project. And it’s not a stretch of the imagination. What better way to create impacts and transients than … well, fire off a whole bunch of artillery at stuff and record the result? With that in mind, I delved deep into Weaponiser. And as a sound instrument, it’s something special. 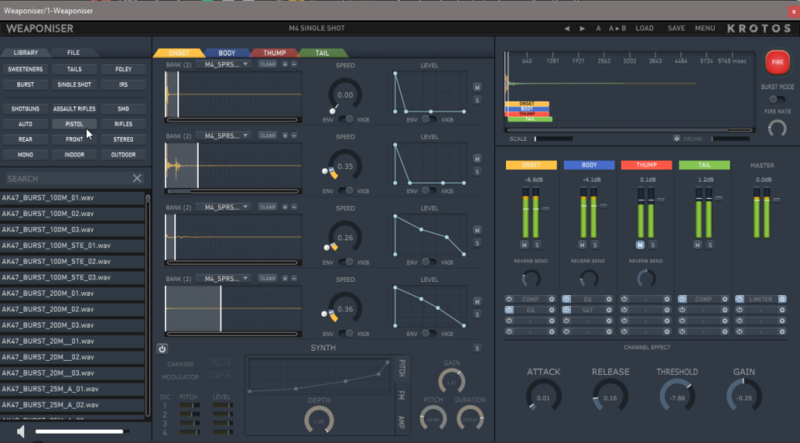 Like all advanced sound libraries these days, Weaponiser is both an enormous library of sounds, and a powerful bespoke sound engine in which those sounds reside. The Edinburgh-based developers undertook an enormous engineering effort here both to capture field recordings and to build their own engine. It’s not even all about weapons here, despite the name. There are sound elements unrelated to weapons – there’s even an electronic drum kit. And the underlying architecture combines synthesis components and a multi-effects engine, so it’s not limited to playing back the weapon sounds. What pulls Weaponiser together, then, is an approach to weapon sounds as a modularized set of components. The top set of tabs is divided into ONSET, BODY, THUMP, and TAIL – which turns out to be a compelling way to conceptualize hard-hitting percussion, generally. We often use vaguely gunshot-related metaphors when talking about percussive sounds, but here, literally, that opens up some possibilities. You “fire” a drum sound, or choose “burst” mode (think automatic and semi-automatic weapons) with an adjustable rate. This sample-based section is then routed into a mixer with multi-effects capabilities. In music production, we’ve grown accustomed to repetitive samples – a Roland TR clap or rimshot that sounds the same every single time. 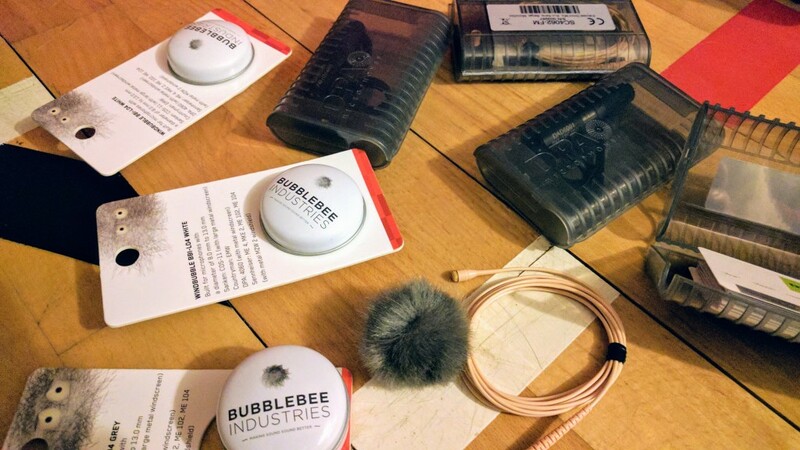 In foley or game sound design, of course, that’s generally a no-no; our ears quickly detect that something is amiss, since real-world sound never repeats that way. So the Krotos engine is replete with variability, multi-sampling, and synthesis. Applied to musical applications, those same characteristics produce a more organic, natural sound, even if the subject has become entirely artificial. Let’s have a look at those components in turn. For those of you who don’t know gun details, that amounts to pistol, rifle, automatic, semiautomatic, and submachine gun (SMG). These are divided up into samples by the onset/body/thump/tail architecture I’ve already described, plus there are lots of details based on shooting scenario. There are bursts and single fires, sniper shots from a distance, and the like. 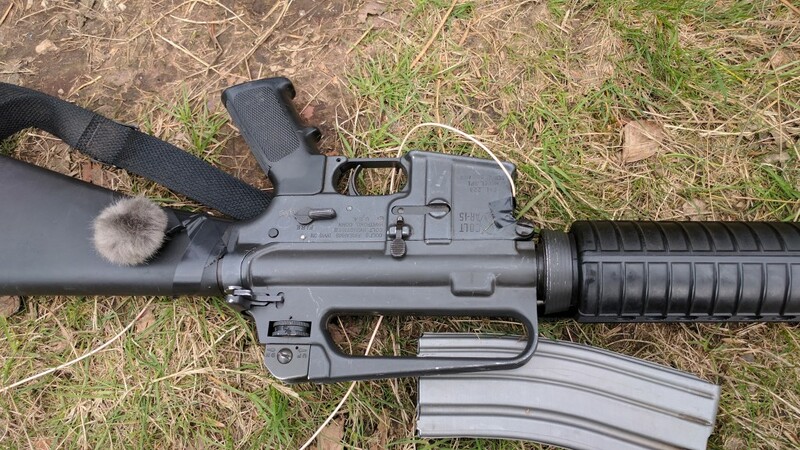 But maybe most interesting actually are all the sounds around guns – cocking and reloading vintage mechanical weapons, or the sound of bullets impacting bricks or concrete. (Bricks sound different than concrete, in fact.) There are bullets whizzing by. And that’s just the real weapons. There’s an entire bank devoted to science fiction weapons, and these are entirely speculative. (Try shooting someone with a laser; it … doesn’t really work the way it does in the movies and TV.) Those presets get interesting, too, because they’re rooted in reality. There’s a Berretta fired interdimensionally, for example, and the laser shotguns, while they defy present physics and engineering, still have reloading variants. 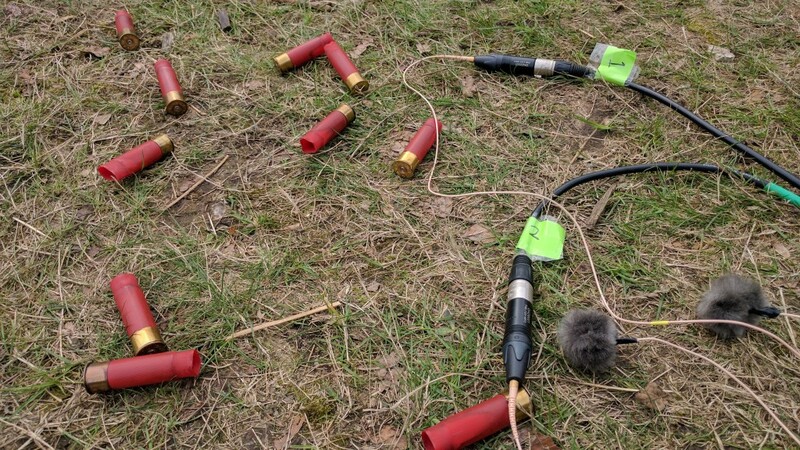 In short, these Scottish sound designers spent a lot of time at the shooting range, and then a whole lot more time chained to their desk working with the sampler. Things that aren’t gun sounds. I didn’t expect to find so many sounds in the non-gun variety, however. There are twenty dedicated kits, which tend in a sort of IDM / electro crossover, just building drum sounds on this engine. 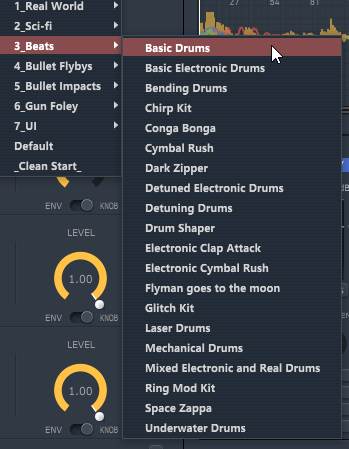 There are a couple of gems in there, too – enough so that I could imagine Krotos following up this package with a selection of drum production tools built on the Weaponiser engine but having nothing to do with bullets or artillery. Variations for each parameter randomize settings to avoid repetition. Four engines, each polyphonic with their own sets of samples, combine. But the same things that allow you different triggering/burst modes for guns prove useful for percussion. And yes, there’s a “drunk” mode. A deep multi-effects section with mixing and routing serves up still more options. Four engines, synthesis. Onset, Body, Thump, and Tail each have associated synthesis engines. Onset and Body are specialized FM synthesizers. Thump is essentially a bass synth. 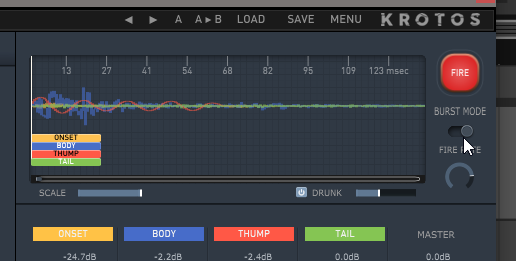 Tail is a convolution reverb – but even that is a bit deeper than it may sound. Tail provides both audio playback and spatialization controls. It might use a recorded tail, or it might trigger an impulse response. Also, the way samples are played here is polyphonic. 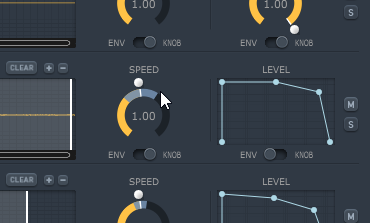 Add more samples to a particular engine, and you will trigger different variants, not simply keep re-triggering the same sounds over and over again. That’s the norm for more advanced percussion samplers, but lately electronic drum engines have tended to dumb that down. And – there’s a built-in timeline with adjustable micro-timings, which is something I’ve never seen in a percussion synth/sampler. The synth bits have their own parameters, as well, and FM and Amplitude Modulation modes. You can customize carriers and modulators. And you can dive into sample settings, including making radical changes to start and end points, envelope, and speed. Effects and mixing. Those four polyphonic engines are mixed together in a four-part mix engine, with multi-effects that can be routed in various ways. Then you can apply EQ, Compression, Limiting, Saturation, Ring Modulation, Flanging, Transient Shaping, and Noise Gating. 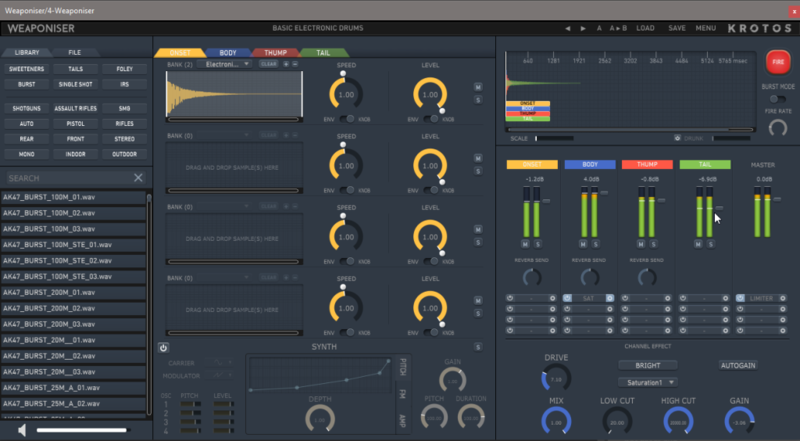 Oh, you can also use this entire effects engine to process sounds from your DAW, making this a multi-effects engine as well as an instrument. Depending on which edition you grab, from the limited selection of the free 10-day demo up to the “fully loaded” edition, you’ll get as many as 2228 assets, with 1596 edited weapon recordings. There are also 692 “sweeteners” – a grab bag of still more sounds, from synths to a black leopard (the furry feilne, really), and the sound recordists messing around with their recording rig, keys, Earth, a bicycle belt… you get the idea. 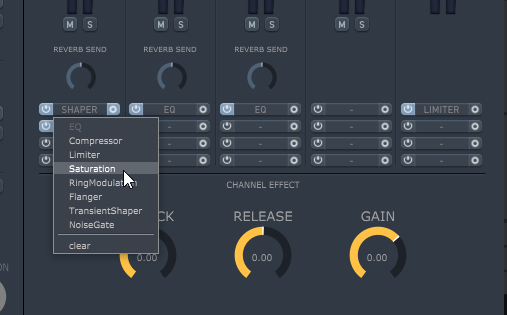 There are also various impulse responses for the convolution reverb engine, allowing you to place your sound in different rooms, stairwells, and synthetic reverbs. The recording chain itself is worth a look. 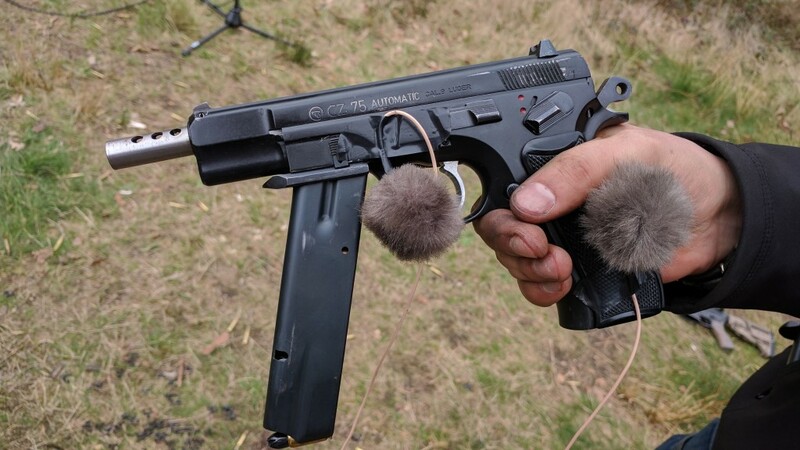 There are the expected mid/side and stereo recordings, classic Neumann and Sennheiser mics, and a whole lot of use by the Danish maker DPA – including mics positioned directly on the guns in some recordings. But they’ve also included recordings made with the Sennheiser Ambeo VR Mic for 360-degree, virtual reality sound. They’ve shared some behind-the-scenes shots with CDM, and there’s a short video explaining the process. Some of the presets are realistic enough that it did really make me uncomfortable at first working with these sounds in a music project – but that was sort of my aim. What I found compelling is, because of this synth engine, I was quickly able to transform those sounds into new, organic, even unrecognizable variations. There are a number of strategies here that make this really interesting. You can mess with samples. Adjusting speed and other parameters, as with any samples, of course gives you organic, complex new sounds. There’s the synthesis engine. Working with the synth options either to reprocess the sounds or on their own allows you to treat Weaponiser basically as a drum synth. The variations make this sound like acoustic percussion. With subtle or major variations, you can produce sound that’s less repetitive than electronic drums would be. Mix and match. And, of course, you have presets to warp and combine, the ability to meld synthetic sounds and gun sounds, to sweeten conventional percussion with those additions (synths and guns and leopard sounds)… the mind reels. But I’m still getting lost in the potential here, reversing sounds, trying the drum kits, working with the synth and effects engines. The plug-in can get heavy on CPU with all of that going on, obviously, but it’s also possible to render out layers or whole sounds, useful both in production and foley/sound design. Really, my main complaint is the tiny, complex UI, which can mean it takes some time to get the hang of working with everything. But as a sound tool, it’s pretty extraordinary. And you don’t need to have firing shotguns in all your productions – you can add some subtle sweetening, or additional layers and punch to percussion without anyone knowing they’re hearing the Krotos team messing with bike chains and bullets hitting bricks and an imaginary space laser. Weaponiser runs on a Mac or PC, 64-bit only VST AU AAX. You’ll need about five and a half gigs of space free. Basic, which is already pretty vast, runs $399 / £259/ €337. Full loaded is over twice that size, and costs $599 / £379 / €494.